What type of music are you enjoying lately? Any songs that you have on repeat right now? It’s time for another Tunes Tuesday linkup with Steff from Run Steff Run and Kimberly from Kooky Runner. We’re so excited to have you share your favorite music with us each week! We’re looking for inspiration for our running and workout playlists and even a “jog” down memory lane as you share your favorite jams! The theme this week is to share your favorite current music, and this week I’m showing love for Craig David! Let me count the ways…LOL! Do you remember Craig David? His debut album, Born to Do It, came out way back in 2000 as I was just entering high school! R&B singer-songwriter Craig David was born in the UK and became a breakout star in the U.S. with the hits songs Fill Me In and 7 Days. He has an incredible voice! Fast-forward to over 16 years later and I’m still in love with Born to Do It and regularly listen to it from beginning to end – it’s a classic! A couple of months ago, I discovered that Craig David has a new album called Following My Intuition and I’m loving it! While Craig is a lovely crooner and has some great ballads, he is also well-known in the UK garage scene. His latest album is very much in that genre. I found out about Craig’s new music while strolling through Youtube and ended up down a rabbit hole of music videos and live performances from the past decade and a half. He’s still got it! So in honor of this week’s Tunes Tuesday theme of “Favorite Current Music”, I’m sharing my favorite new Craig David songs and throwing back to some of my older favorites too! Hopefully, you find a new track or two to add to your workout/running playlist! 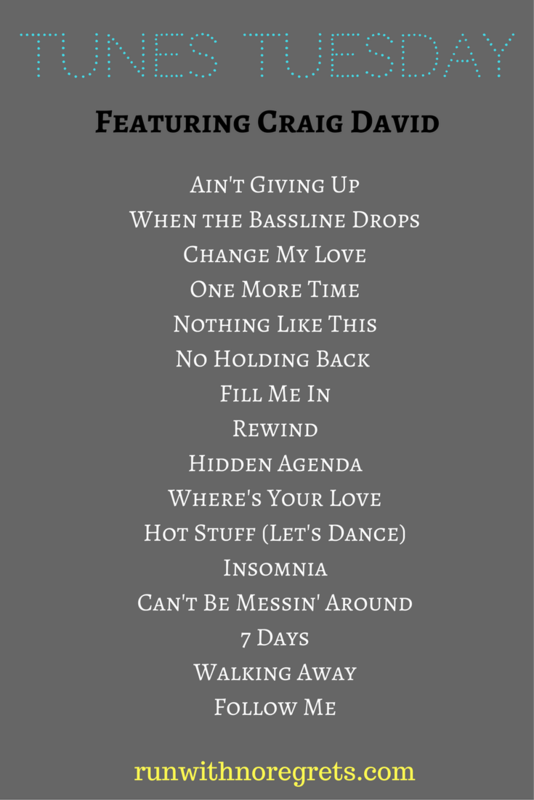 Ain’t Giving Up – definitely my favorite song on the album and is usually in my head at any given date or time! The music video is really fun too! Change My Love – I love this song…it’s a little more slow-tempo but still very current. I think this should be on the radio right now! One More Time – very fun and upbeat with some fast rapping by Craig. No Holding Back – this is a song with Hardwell, the hook is catchy! 16 – I love this because it’s an updated version of Fill Me In, almost like a remix! Plus, Craig David rapping is always fun. Fill Me In – always a classic. Rewind – I never knew this song was with Artful Dodger, and to be honest I don’t understand half of what he says! Hidden Agenda – from Craig’s Slicker Than Your Average, I’ve always loved this song! Where’s Your Love – this is another song that I’ve become hooked on! It also features a young Rita Orta…who knew? Hot Stuff (Let’s Dance) – I loved when this song came out! For whatever reason, it’s impossible to find the Trust Me album online to purchase, but it has some great jams! Insomnia – very reminiscent of a Chris Brown or Taio Cruz song, but I love it! Can’t Be Messin’ Around – this is one of my favorite Born to Do It songs, has a great beat! 6 of 1 Thing – thanks to Youtube, I know that this song that I’ve loved for years has a music video…go figure! 7 Days – of course, where it all began! Walking Away – just a really well-written song! Follow Me – it just has that late 90’s sound…love it. You Know What – this has been one of my favorites for years! Rise and Fall – very nice duet with Sting! All We Needed – on the newest album, the simple production really lets Craig’s voice shine! What If – very reminiscent of old-school Craig David. In a month with five Tuesdays, we’ll have a free week! – We hope you join us next week! Do you like any Craig David music? Do you prefer Craig’s upbeat UK Garage or slower R&B side? Which artist are you really loving right now?